Order ‘Pu-239’ starring Paddy Considine and Oscar Isaac, available right now at a great price by clicking on the book cover above! Oscar Isaac, my guest today, co-stars with Paddy Considine in a riveting new HBO film, Pu-239. 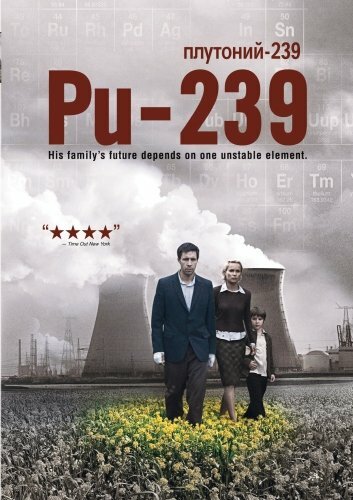 Based upon a short story by Ken Kalfus, PU-239 tells the story of a devoted father and husband — Paddy Considine — in post-Soviet Russia who labors in a deteriorating nuclear plant. After being exposed to a deadly dose of radiation while trying to avert a plant disaster, he is made a scapegoat and suspended without pay. With just days to live and desperate to provide for his wife and young son, he impulsively steals a small amount of Pu-239 — weapons grade plutonium — and heads to Moscow to attempt a quick sale. In Moscow, Considine’s character gets caught up with an inept, wannabe gangster — played by Isaac — to help him sell the dangerous goods on the black market. BOB ANDELMAN/Mr. MEDIA: I appreciate your time. I gave kind of a brief synopsis of the film, but the name of the film won’t mean a lot to the average person any more than it did for your character, actually. What would you like people to know about this movie? OSCAR ISAAC: I think there are so many elements that make it such a unique film. I think it’s very unlike any film I’ve really seen in some while. The closest I can think of it is films from the 1970s that weren’t afraid to kind of experiment with tone and genre and all that, so it is a very sad, tragic film about this man that’s trying to help his family, but then at the same time, there’s this very humorous side to it when he meets this criminal and this unlikely bond, kind of buddy thing, happens with the two of them. I think it’s very exciting. It’s kind of Jacovian in that way, a lot of humor and, at the same time, the tragedy is involved just in the same intensity. ANDELMAN: What drew you to this movie? Was it the drama? Was it the politics, the buddy…. ISAAC: Honestly, it was the script, the way it was written, and the character. It’s just fantastic. I mean, I think it’s just really full of life and humor. Both the director, Scott Burns, and myself, one of our favorite movies, at least for me, my favorite movie of all time was Dog Day Afternoon. It reminded me of it in that kind of way, where you have this guy who’s way in over his head, but he’s just trying to make it work, and you end up feeling sympathy for him even though he’s kind of a screw-up. I like that a lot about him. Star Wars Episode 7 Pop! Oscar Isaac as Poe Dameron. Order yours now by clicking on the figure above! 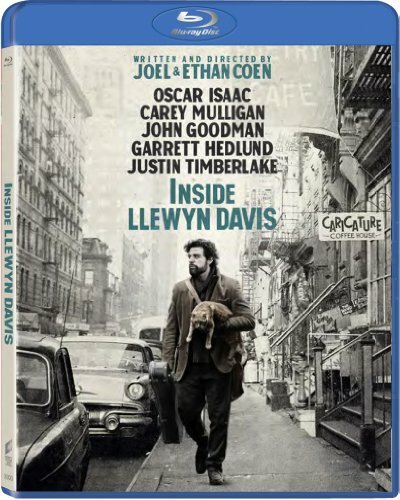 Order ‘Inside Llewyn Davis’ [Blu-ray] starring Oscar Isaac, available from Amazon.com by clicking on the DVD cover above! ANDELMAN: There are actually two guys in this movie that are way in over their heads. ISAAC: Exactly. And you know, that’s also a great point that these two different characters really are mirrors of each other in different extremes. Paddy Considine’s character is way in over his head by deciding to go into the black market. He’s a scientist and suddenly he’s forced to do this wheel and deal, something he just doesn’t know how to do, but he’s trying to save his family. And on the other side of it, you’ve got my character, who is also trying to save his family — whatever his definition of family is, his girlfriend that’s a prostitute and his son that he’s not sure if it’s his — but even that, he’s trying, he’s working in this new, crazy, anything goes Wild West of capitalism in the Soviet Union, the former Soviet Union, and now he’s just trying to do what he can, and I think that’s ultimately what’s really great is that these two guys are trying to fight for their families. ANDELMAN: I think when I was done watching it, the thing that struck me was — and I’d like to go read the short story, frankly — it’s so well-conceived, and the comparison and the contrast between the two characters, you’ve got the two men, family as each of them defines it. Paddy’s got the wife and son. We don’t know them until the incident occurs at the nuclear plant, but they seem to be happy and in love and all that kind of thing. And then Shiv, your character, defines family a whole different way. ANDELMAN: When the two of you come together, it’s kind of like oil and water, but somehow, as it does in buddy movies, it does sort of work. Oscar: I think again, it’s this need. You don’t really hear it from Shiv until the very end where he doesn’t know how else to keep Timofey, which is Paddy’s character, in the car, and he says, “Look, I’m doing this for my child, too. This whole time you’ve been talking about your child and your family and what you need, but I’m not doing this for fun or to be cool, I’m doing this because I have a family, as well.” That’s a very strong motivator. ANDELMAN: It’s very interesting. I’m listening to your voice, and truly, and people will get this when they see the movie, there is some strong acting going on in that film, because you don’t sound anything right now, anything like the character of Shiv. ISAAC: No, right. Yeah. I gave a little higher register voice, and he, of course, we did it all with accents It was a tough decision: how you are going to give it an authentic feel. Either everybody does British accents, or … It was an international cast, as well. There were British people, there were French, people from all sorts of different places. ANDELMAN: Your character has some interesting thoughts on the British and the Americans, of course. ISAAC: Yes, he does. Very specific feelings as they concern his girlfriend. He gives her rules of who she can sleep with based on his own sociopolitical ideas of people. 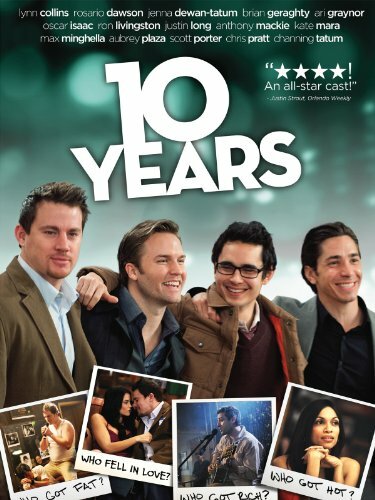 Order ’10 Years’ co-starring Oscar Isaac, available from Amazon.com by clicking on the DVD cover above! ANDELMAN: Some of the best moments in the movie are the small ones. Again, it’s about you with the boy who you think is your son or you and Paddy in the car kind of connecting again through children, but you each kind of know that your life is in dire jeopardy. As an actor, that’s good stuff, isn’t it? ISAAC: For me, that is one of my favorite moments, wow, that one moment when they’re both in the car and he just asks if you have any pictures of your son. My son, he loves to go to all the new McDonalds and try the Big Macs and see if they all taste the same. And there’s just a little moment where nothing seems to be happening, but kind of everything is there, everything is revealed about these guys with just a little bit. I think that’s really a testament to the writing. Scott Burns just has a way of creating an intense amount of empathy with humor and with putting humor and tragic elements together in one sentence even, and it ends up being something very human and specific, and I think that was really one of the great things about the film. ANDELMAN: You have some moments in the film that are fairly brutal, mostly with you on the receiving end. Are those difficult to play? ISAAC: It can be, because pain, usually as an actor you’re looking for the action of, what are you doing, what are you trying to do, what are you trying to change, and it’s hard to act a state of being, like cold or hurt, and so that can be challenging in its own way. But again, those are also fun, because they are very physical, and you get to put the makeup and the blood on. Those are fun. The harder ones seem to be the more emotional scenes. ANDELMAN: What was your relationship with Paddy like during this? There’s a point where you have to threaten him rather physically. How did you two deal with that, set that up? Star Wars VII – 18″ Poe Dameron (actor Oscar Isaac). Order yours now by clicking on the figure above! ISAAC: It’s funny, because I remember the first day, I think he was very surprised at my take on the character. I think a lot of people were, because the script itself, like I said, it’s fantastic, but a lot of times an actor will kind of imagine some things. Talking with Scott, we made them very specific and funny, and I think he wasn’t expecting that, so suddenly, I think he was kind of quiet a lot and a little bit dark and unsure in that place, and then with all that humor, he kind of really lightened up. After a while, we were just cracking each other up. I remember once in particular we just couldn’t get through it, and there wasn’t even anything that funny. We just couldn’t get through it. He would always laugh, and that would start to make me laugh, or I would start to laugh, and you can’t help it. It’s actually a horrible feeling, and the producers had to come over and were like, “Guys, you really need to pull it together.” I’m like, “I’m sorry. I’m sorry, but it’s just so funny.” It was great. He’s a wacky man. He’s an amazing actor, and it was great to hear his stories and to feed off of him. He’s a wonderful actor, and for me, it was my first film, and to be able to spar with him on screen was amazing. ANDELMAN: You mention that, this movie looks like it could be a significant launching pad for you. Sometimes you’re sympathetic, the reluctant gangster, sometimes violent. Are you excited to get this out in front of people? ISAAC: Yeah. It’s been almost two years since we shot it, and I am very anxious to get it out there. Then again, it’s done, and there’s not much I can do. I have no control over it or how people are going to take it. I really do hope that they enjoy the film, because I do think the movie is really good, and like I said, it’s unlike a lot of films nowadays. I’m actually curious to see how people take this kind of mixture of tones. A lot of times, films can be very straight forward: “This is a sad movie.” “This is a funny movie.” Scott really tries to make a full picture of life. ISAAC: I think that would maybe come into my mind if I felt that that was happening in some little way. But I think that it’s less about the Russians and more about, if anything, capitalism. I think it does in a way make the argument that plutonium in the wrong hands is just as deadly as capitalism in the wrong hands, and not to say that the Russians are the wrong hands but this idea that if unchecked, it’s kind of an anything goes mentality. And I think that, for me, the political aspects of it were, that was the strongest as opposed to Russians or crazy gangsters or even the good ones are going to sell plutonium. ANDELMAN: That’s kind of a scary notion. ISAAC: Again, the main sympathetic man that you feel so much empathy for is actually doing a very vile, horrible thing, which is selling plutonium on the black market to who knows, for what reason. ISAAC: Yeah, my family can fly to Costa Rica, but…. I think that’s a very real thing. I think when you’re in survival mode, I mean, look at what happened… I was just watching television, and you can see the ivory trade and they kill these elephants and all sorts of different horrible things that happen, and I think it’s just because it’s the mentality of survival. ANDELMAN: Is this the first time you’ve had a role where you’ve had to answer questions that were political? ISAAC: No. Nowadays, everything has a little bit of a political undertone, but no, I did a play where I played Lorka, and he obviously is considered quite a political figure, being killed by the Franco regime, and so there were those aspects in there. Yeah, I’ve done some of that already. ANDELMAN: And then you mentioned the producers. Three of the executive producers, George Clooney, Steven Soderbergh, and Peter Berg — pretty big names. Clooney known for political stands. Did these guys, are they just names on the film, or was there any hands-on with these guys in your part of the film? ISAAC: In my part, no, not the actual filming of it. I know that Steven Soderbergh — I could end up working with him as well on a film, and we talked a lot about it, and I know that he was integral in the editing process. I don’t know exactly what George Clooney and Peter Berg, exactly what their roles were. ANDELMAN: It’s interesting. I could see, thinking back on it, I could see Clooney actually in Paddy Considine’s role. Star Wars Ep VII: The Force Awakens — Oscar Isaac as Poe Dameron — X-Wing Adult T-Shirt. Order yours now by clicking on the figure above! ISAAC: Oh yeah? Yeah? Definitely. I could see that. ANDELMAN: You could have been doing a buddy film with George Clooney. ANDELMAN: Oscar, you were born in Guatemala? ANDELMAN: Were you surprised to be offered a role as a Russian? ISAAC: No, not really. I was born in Guatemala. I did grow up in the States. I’ve been here all my life. I’m pretty, I guess some would say, ethnically ambiguous, so no, I actually wasn’t. My father is Cuban, and actually my grandfather worked for the government, the revolution, and he actually had quite an obsession with all things Russian, all things Soviet, I should say. I don’t know if that kind of translated into my blood somehow, but I feel somewhat similar. I love, my favorite playwright is Chekhov, I read it all the time. I just read Crime and Punishment again, and there’s something about that soul and that voice, I don’t know, I really relate to. So actually, I kind of felt quite at home. ANDELMAN: It wouldn’t be hard to see you go in either the direction of playing like another gangster, maybe even a more serious gangster, or going and playing more in a comedy kind of thing. What would be more comfortable for you? ISAAC: When I read something, I look for the humor in it, but that doesn’t necessarily mean I want to do some sort of broad comedy. I’m really interested in being, I don’t if this will sound somewhat pretentious, but truthful but something that really has some sort of… Mike Nichols said that, “A laugh is just a really loud yes.” I think that’s great. I want to do films and plays that give the audience that feeling of saying, “Yes, yes, that’s true, that is the truth! I recognize that,” and whether that’s as a gangster or as a very comic role, that’s okay with me. ANDELMAN: Where did you train? Where did you learn your trade? ISAAC: I went to Julliard. ISAAC: I went up here in New York for four years. ANDELMAN: That tends to open a lot of doors for people. ANDELMAN: Any particular uncomfortable experiences from that? ISAAC: There were so many. I did remember finally breaking down and crying. It’s tough, because a lot of times they’ll kind of get into, “You made that choice because you are the kind of person.” It’s kind of a mind to mind game there, but it’s all in the goal of becoming a better artist, and so I forgive it all, but yeah, it’s just the name of the game. It’s very hard training. ANDELMAN: What would a hazing at Julliard be? Would they make you re-enact Pauly Shore roles? How would that work? ISAAC: They had all their own little weird games they do with masks and Dionysus and Greek gods and all sorts of silly things. ANDELMAN: So you’re saying it’s like a Stanley Kubrick movie? ISAAC: Yeah, exactly, exactly. More like that than Pauly Shore. ANDELMAN: I suspect a lot of people will be introduced to you for the first time through this movie, and they are probably going to wonder a little bit more about your background. You talked about having kind of an ambiguous ethnic background. How old are you? ANDELMAN: A young guy. Are you married? Star Wars The Force Awakens 3.75-Inch Figure Space Mission Armor Poe Dameron (Pilot), Oscar Isaac. Order yours now by clicking on the figure above! ANDELMAN: Why acting? Why not anything else? ISAAC: That’s funny. I was trying to think about that. A lot of people will say, “Oh, it’s something I’ve always wanted to do,” and in some ways, that’s true, but I was thinking back to what, something that Dostoevsky says, and actually Tolstoy says about the main character in Crime and Punishment, he says, “The mechanism of life happens in the barely imperceptible things.” It’s the tiny little shifts of consciousness, so when this main character in Crime and Punishment murders these women, that’s not real life. He’s just acting out. He’s just being a machine. The real shift happened when he was thinking about something completely other that made him become this person. So I was trying to think about that in my own regard as far as acting is concerned. I’m doing this Ridley Scott film right now, and I actually realized that the first time that I really started to shift my mind into this world of movies and acting was I think with the film Legend. I think that’s the first time that I consciously remember thinking, “Wow, people made this. There are guys that said, ‘I want lights here. I want you to do this, there are cameras, and there’s maybe one guy that this was his vision, and I think from that point on, I started seeing movies differently and grabbing video cameras and trying to emulate that and performing in…. I think there was definitely a small shift that happened. ANDELMAN: What it is you are working on now? You made reference. ISAAC: It’s a film called Body of Lies. It’s Ridley Scott’s next film. It’s with Leo DiCaprio and Russell Crowe. ANDELMAN: That’s definitely big-time stuff. ISAAC: It’s good. It’s very exciting. We’re shooting in Morocco. ANDELMAN: What is your role in that? ISAAC: I play the partner to Leo’s character. We start off the movie together. I get to do some car chases, and it’s a very explosive character. ANDELMAN: I have to ask, I didn’t know you were doing this, what’s it like working with Leonardo DiCaprio? ISAAC: It’s great. You know, you never know when you are going into one of these situations. You are like, “I hope they’re not jerks,” or whatever, but he’s a really nice, really funny guy. We were joking around right off the bat and already starting to improvise and doing different things, and he’s a really good, solid actor. He’s a great actor and seems like a really great guy. ANDELMAN: A guy like that’s been around a while now. Is he a little, at first when you come on the set with someone like that, he doesn’t know you, you don’t know him I’m assuming until you meet on the set. Is he a little standoffish at first? ISAAC: You know what? No. I think that’s what was the most shocking. That’s what I would assume, but no, he was actually incredibly humble, he was really warm, seemingly excited to meet me. I was honestly taken aback with the whole thing. I kind of felt bad for even expecting otherwise. He’s a really good guy. ANDELMAN: And what about Ridley Scott? How is he to work with? ANDELMAN: You’ve completed another film, Guerrilla. ISAAC: Yeah. That’s the Soderburgh film that I shot about Che Guevara, with Benicio del Toro. ISAAC: It’s two films, and I’m in the second film. I play Che Guevara’s translator when he comes to the United Nations. The film is in Spanish, except that this section is in English where I translate all the things he says and when he goes on “Meet the Press.” He had this actually son of a diplomat who wasn’t a professional translator translating for him. It’s kind of funny, because he listened to the tape, he watched the tape, and you can tell he got a little bit lost, which is good, because I was a little bit lost myself. ANDELMAN: What would you like to do in the future? It wouldn’t be hard to see you jumping into a buddy caper, like a Rush Hour, but you seem to be heading into kind of more serious, from what we were just talking about, more serious roles. ISAAC: I like the idea of doing “serious roles” but finding the humor and the humanity and the every man in that. I don’t necessarily see myself doing a broad comedy or action films necessarily. I want to do things that have something to say, whether it be political or whether it be about the human condition, but something that has something to say, like those films from the 1970s. You felt that they were made for a reason, not just to satisfy some sort of budgetary need or something.